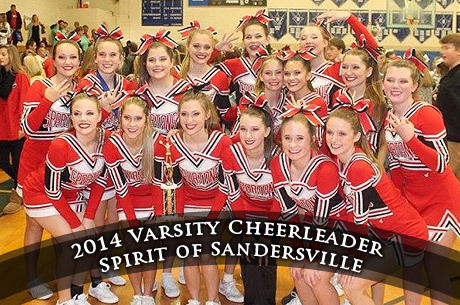 Varsity Cheerleaders win 3rd place at Spirit of Sandersville competition on November 8. Kaylee Davis represented EBA in Individual Jump Off and won 1st place. Way to go girls! The Varsity Cheerleaders attended the Fellowship of Christian Cheerleaders Cheer Camp June 1-4, 2010. The squad received a "Superior" for Game Ready cheer, FCC cheer, and FCC sideline. The squad also won first place and were named camp champions. Dylan Smith placed 1st in the Jump Jam and Tumbling and was named as an All Star. Lauren Chancey and Bailie Ruffo were also named All Stars. Congratulations to the Varsity Cheerleaders! Congratulations to the Varsity Competition Cheer Squad for becoming GISA AA State Runner-Up during the 2009 season. There were 10 schools competing in the AA classification and 9 schools competing for the AAA title. The squad consists of Taylor Meadows, Anna Ready, Sammy Seay, Brooke Hargrove, Laney Lewis, Ashley Chambers, Lauren Chancey, Jessica Story, Bailie Ruffo, Dylan Smith, Stevie Seay and Kate Reeves. They will compete one more time in Atlanta on December 12 with Fellowship of Christian Cheerleaders. Congratulations Cheerleaders! Good luck in the next one.